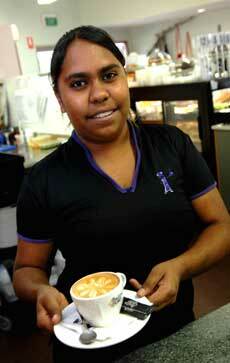 The coffee shop attached to the Institute of Aboriginal Development (IAD) will close in a few days. Neither IAD nor the café’s manager agreed to be interviewed about the closure. 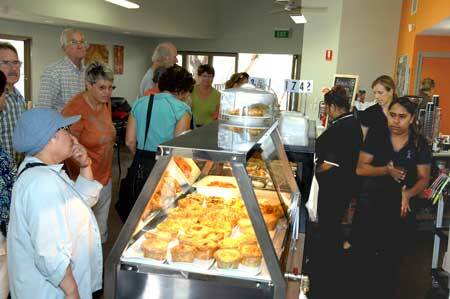 The café was started in about 2010 as a Future Stars Indigenous Employment Program project by Karen Sheldon Training and Development. Ms Sheldon says the initiative was “to introduce highly disadvantaged local Indigenous jobseekers to jobs in the hospitality industry. The initiative came under the Australian Government Indigenous Employment Panel scheme, but funding was not continuous, and after some failed lease negotiations with IAD, the program came to an end late in 2012, she says. The Federal Government has now created GenerationOne, a “demand-driven training model” to cost up to $45m, creating 5000 jobs for young indigenous people. According to Indigenous Affairs Minister Nigel Scullion it will be breaking “what has become too common a cycle of training for training’s sake”. Ms Sheldon has thrown her hat into the ring for this scheme, promoted by mining magnate Andrew “Twiggy” Forrest. So far the non-profit organisations BoysTown and Marist Youth Care opened the first two Vocational Training and Employment Centres (VTEC) in the outer Brisbane area of Kingston and in Western Sydney. BoysTown will train Indigenous people to fill 150 guaranteed jobs, and Marist Youth Care, which works with young people at risk, will train Indigenous people to fill 250 guaranteed jobs within two years, says Senator Scullion. The Department of the Prime Minister and Cabinet says an “expressions of interest process is underway to develop a pool of potential VTEC providers. Details will be announced at the appropriate time. The jobs range across a variety of sectors including hospitality, cleaning services, property and business services, retail and trade. Ms Sheldon says the new scheme almost perfectly mirrors the one her company has been developing and refining in various places throughout the NT including Alice, Tennant Creek and Darwin over some years. “The pre-employment phase of the program builds self-esteem, confidence and basic employability skills,” she says. “These are practiced and reinforced in the ‘incubator’ phase. The trainees are working in real jobs for real wages and gradually building their working life capacity, and dealing with their barriers to work. Ms Sheldon has worked with many employers in the Centre such as Chifleys, Hilton, and numerous public and private employers. “My company is keen to continue this work if selected as a VTEC provider,” she says. Coming from Victoria, her work in the Territory started in 1975 as a cook in the Barrow Creek Hotel where she had her first contacts with Aboriginal people. As a partner in Tennant Creek’s only 24-hour service station and Red Rooster with her brother and Julalikari Council Aboriginal Corporation, she says she has seen first-hand “the hopelessness of people who do not have control of their own future and have given up trying. “A person with a job is a person with a future – and the jobs are abounding. It is a matter of taking the carefully measured small steps needed to make the connection, and of never giving up on anyone. PHOTOS, from top: Zahri Sultan, a trainee under the previous management by Karen Sheldon. • The cafe in its heyday. There is also reference to Karen Sheldon in the article referring to “some failed lease negotiations with IAD.” Read between the lines and you might have a better idea of the real reason the café is closing. If somebody says that they are not willing to comment at this time, there is usually a real reason!